I would like to know what factors I need to take into account in a general position before pushing a central pawn, exchanging it if possible or simply moving another piece. As usual, I will provide an example of one of my games. Please try to give advices for this particular position as well as other suggestions for any other situation (I know it is difficult to generalize but try to tell me what to avoid and what to look for). In cases like the one below, I always feel I have not the foggiest idea of what to move and in this case, I should have moved d4. If my opponent had pushed one of their central pawns I still am at loss. I do not know if the benefits for my opponent of pushing them are better than the disadvantages. As I mentioned earlier, I cannot tell if I should exchange that pawn or push my thereatened pawn. Hopefully, someone can help me out to never be at loss again (or at least, in few cases). Why are central pawns important? To answer that, I'll make a quick digression and talk about an underlying fundamental idea : how can pieces be used to their fullest potential? For that, they need to be placed on the square that best fits them. In general, the best squares for pieces are the central squares. There, they reach maximum activity (approximatively number of possible movements), and they target squares in the enemy's side on both wings which stretches out enemy defenses. However, placing pieces in the center too early is dangerous because pawns could chase them away ; a pawn is less useful than a piece, thus the trade would favor the side trading the pawn for the piece. What pawns can chase away pieces on central squares? Central pawns. This introduces the broader concept of space ; controlling more squares, or many key squares, forces enemy pieces to passive positions so they can stay safe. Meanwhile, your own pieces get more squares to maneuver towards the enemy King, whose own pieces will have trouble defending because of their crippled movement. Moving central pawns to control central squares is a basic way of achieving a spatial advantage ; enemy pieces cannot land to the center, but yours can, and may further be supported by these very pawns to deter trades. Spatial advantage itself is a static advantage, it will remain for a long time, until around when pawns delimiting that space disappear. Thus, you should consider how your own piece will find activity on the long-term. However, pushing pawns bring static weaknesses like weak squares or backward pawns. It's a strategic trade-off : you believe the opponent's pieces won't be able to coordinate around these weaknesses because they lack space to move. Of course, this is just the strategy outline, verifying by calculation is the only way to make sure it's a good idea. One thing is required to gain space though : the center must be mobile, pawns must be free to move forward. It doesn't mean that a good pawn center is a mobile one (White's blocked c4-d5-e4 center in the KID is very strong), nor that pawns should be pushed whenever possible. But as long as the possibility remain, you can disrupt enemy pieces with a timely central pawn advance, to force them into passive positions or cut their communication with one another. A mobile center is thus both a static asset (space advantage) and a dynamic asset (pawn breaks). Finally, like others have pointed out, a classic pawn center isn't just a strength. It can itself be targeted. For instance, if the opponent manages to make the pawns advance forward on his own terms, he could access uncontrolled central squares, or pile up on a backward pawn, or target the base of the pawn chain, and so on... . That's the idea behind fianchettos : placing the bishops on safe squares where they'll apply constant pressure on the opposing pawn center to make it eventually move. This approach is not without faults : fianchettoing bishops takes time, and failure at breaking the pawn center would doom the bishops to passivity. Remember the pawn center is strong even without advancing. When the opponent uses their own pawn breaks, ask yourself whether your pieces would be more active with your current center or after advancing a pawn. Would a pawn exchange actually help your own pieces? Would space still be efficiently controlled? Understanding these strategic concepts will greatly help you figure out if you should move a central pawn. Note that this also translates to wing pawns, except pushing them is more situational. The squares they control aren't frequently as crucial as central squares. Think twice before spending a move on pushing them. Your pawn center may control the center efficiently, but it has two weaknesses : the d4 pawn and the d4 square. The pawn cannot be protected by another pawn without moving. If your pieces don't protect it enough, you'll have to push it, and that will add weak squares on e5 and c5 to the already weak d4 square. Meanwhile, Black doesn't have 3, but 4 pawn breaks : c5, d5, f5 and ... e5. As pointed out by Stockfish, Black could play 9... d6 followed by 10 ... e5 to challenge d4, an idea that is also seen in the Nimzo-Indian. This is arguably the most threatening pawn break on the short term because it precisely targets d4, supported by the g7 Bishop and the c6 Knight. "d4 is my weak spot, so I'll overprotect it first!". "d4 is hard to protect, but I've developed all my minor pieces and control the center well. I can definitely push forward for EVEN MORE SPACE!". Indeed, after 9. d5 exd5 10. exd5 , White transforms his central pawn front into a (c4-d5) pawn chain. A key idea with pawn chains is to overprotect the top of the chain, namely d5. It's supported by Nc3, c4, and indirectly Qd1. Furthermore, the Bd3 protects c4, a support point of d5. On top of that, it takes c6 away from the d7 Knight and blocks the b7 Bishop! It's looking good so far, but can Black exploit d4, c5 and e5? Concretely, after 10... Ne5 11. Nxe5 Bxe5 12.f4 Bg7 (Bxc3 13. bxc3 Nf5 14. Bxf5 gxf5 15. Bd4) 13. f5! , White opens lines on the kingside and activates all his pieces before Black has time to counterattack in the center. In particular, the b7 Bishop is looking poor. "I've got a good center, and my minor pieces are out, but not my Rooks. Let's get them into play!". Chess is a team game, play with all your pieces. It's hard to see when the a1 Rook will enter the fray with tempo, so getting it out first to reinforce the center provides it at least some use. Plus it supports the c3 Knight, and won't be targeted by the g7 Bishop anymore. It also allows Bb1 without interfering with Rooks. For example, 9. Rc1 d6 10. Bb1 e5 11. d5 , or 9. Rc1 f5 10. e5 (Qd2!?) d6 11. Ng5 Qd7 12. f4 shows White retaining their spatial advantage while reorganizing their forces. Note that 9. Re1 serves the same goal, but is weaker because it doesn't blend well with the other pieces, plus the f1 Rook already had better prospects than the a1 Rook. He could take initiative with 9... Nb4 10. Bb1 d5 11. cxd5 exd5 12. e5 c5 , which would activate his pieces. Tying this back to the original problem, in this position (9th White move), White isn't forced to push his pawns, they're already plenty strong. For instance, 9. e5 Nf5 or 9. c5 bxc5 10. dxc5 Ne5 aren't coherent ideas with White's positional assets. In the 9. Rc1 lines, White doesn't push a pawn until the opponent has committed in the center. Nevertheless, pushing d5 first does look good here. Pawn breaks are important moves to always consider, and in particular, are one way to demonstrate an advantage from creating an ideal center, like in the KID 4 Pawns Variation. The example position would fall in the camp of hyper-modern theory. This is where one side occupies the center with pawns and the other side attacks the center from a distance with pieces only to strike in the center when suitable. In general you want to think of pawns in relation to pieces. Does advancing hinder the enemy pieces and help yours? What squares do you gain or weaken? 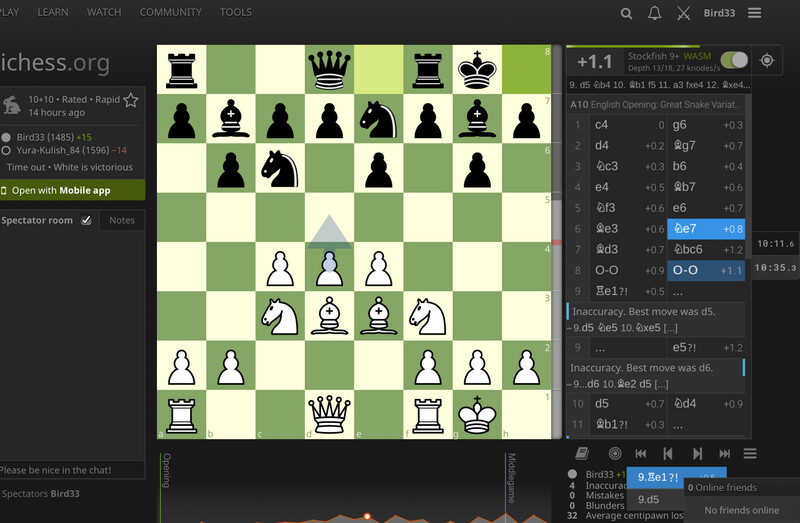 With pawns side by side you create a nice front, and in the position given there is nothing weak. The pawns are dynamic and well guarded. It is Black that wants to provoke their advance so they can leave holes or become over-extended and weak. So, unless there is something of forcing benefit to White in pushing a pawn I would continue to develop pieces. If pushing did not convince me, I would consider prophylactics: Black can consider 3 pawn moves that attack the center - d5, f5, and e5. I would analyse lines trying to thwart these moves. In the present position d5 looks reasonable, but only concrete analysis can tell if it is good enough for a clear advantage. I would probably play Qd2 here. Not the answer you're looking for? Browse other questions tagged pawns or ask your own question.